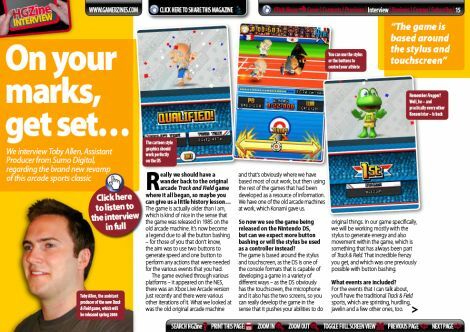 In the latest edition of HGZine magazine on page 15/16, I interview Toby Allen who is the Assistant Producer from Sumo Digital regarding the Nintendo DS game ‘New International Track and Field’. The interview is an audio recording with a cut down transcript that both feature in the magazine for your enjoyment. HGZine is a free PSP magazine / DS magazine – it covers both formats and stands for HandHeld GamerZine. 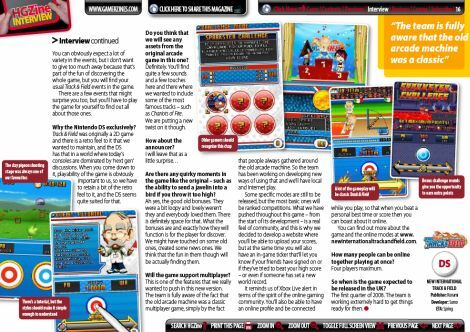 This free video games magazine is written by professional games journalists and you won’t find any of the content anywhere else. Inside you’ll find previews, reviews and interviews on all the biggest PSP games and DS games. The free PSP and DS magazine is enhanced with video and multimedia on the pages themselves, so it requires a PC. Now if only I had a fancy sports car, a gold castle and I was a… Oh hold on I am a writer!